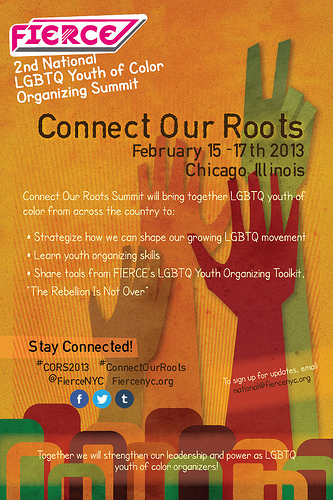 From February 15-17, 2013, FIERCE held our 2nd National LGBTQ Youth of Color Organizing Summit: Connect Our Roots, in Chicago, Illinois. Over three amazing days, we shared, learned and visioned together with an amazing group of over 30 LGBTQ youth of color organiers! Share: We heard from one another about the issues that we face in our cities, states and regions and what particular obstacles we are facing. We deeply explored issues that our communities face locally and regionally in order to identify issues emerging nationally. Learn: We know that there is really powerful organizing already happening, so we created space for youth organizers to share their skills and strengths with one another. FIERCE was excited to share some of our skills in base-building and campaign development, as well as learn from participants. Click here for a full description of youth-led workshops that took place at the summit! Vision: It's not often that LGBTQ Youth of Color get to come together to talk and learn from each other. At the summit, we spent time visioning what solutions we want to see to address the issues that impact us and discussed what skills we need to win local campaign victories! Together, we explored how we can better support each other in strengthening the presence,capacity and power of LGBTQ youth of color across the nation! We asked these groups to be host committee members because of their history and current work with LGBTQ youth activism and because of shared political values. The host committee supported the Connect Our Roots by helping with outreach efforts, attending the summit, giving feedback and helping to shape the summit agenda and format. They also organized social activities and shared information about their incredible work with Connect Our Roots participants. To all the Host Committee Members: Thank you for all the work you've done to support FIERCE in helping us spread the word and welcome people to Chicago. We are thrilled to have LGBTQ youth organizers representing 21 organizations attending the summit! Funding for youth scholarships were provided by the Arcus Foundation. Click here to download a description of youth-led workshops that took place at the Summit! To learn more about FIERCE's National Program or sign up for updates about future summits or movement building opportunities, email national@fiercenyc.org.